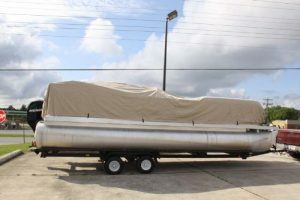 Although most pontoon owners probably live fairly close to a river, lake, or bay where they can take the boat out easily, some of us aren’t that lucky and might have to tow their pontoon boat several hundred miles down the highway to that perfect sailing spot. Some people prefer keeping their boats in the closest marina – which I actually recommend, as it’s probably the easiest and safest thing to do for a boat owner (as you don’t have to worry about security, wear, damage, etc..) However, some marinas will charge you stellar amounts for docking your pontoon on the spot, and the price depends on the area, weather conditions, and other details that you would usually have to discuss with them. You need to check with your state’s speed and weight limits for trailers first. Then sit down and do a bit of math and see if your pontoon plus trailer weight falls under the legal limit. If it does, the next thing you want to check is if your boat insurance covers and tow and trailing related damage. I’m gonna go ahead and assume that it does not – since a lot of the generic boat insurances don’t cover that, but that doesn’t mean you can’t tow your pontoon – just be extra careful because you’re probably gonna bear the cost of any damage that occurs during tow and trail. Lastly, make sure you don’t go over the trailer speed limit – no explanation needed here. First, check if your car or truck can trail the combined weight of your boat and trailer. Some smaller vehicles may not be able to, and I’d recommend you figure out something else rather than attempting to trail something heavier than what your vehicle allows. Second, make sure you check the tires, lights, and trailer hitch – make sure they are in perfect condition and you have a spare tire on you in case something happens. If you haven’t towed anything in your life before, starting off with a 20-grand pontoon boat is gonna be pretty challenging (and stressful!) I recommend you practice on shorter distances before hitting the highway, and also consider that turning and stopping is gonna be much harder with the boat in tow than without it. However, don’t let that scare you – as I said, a bit of practice is all it takes to master it. Definitely check with the legal stuff first, I had to pay $300+ fine after going over the trailer speed limit once.